a deep place in my soul. that will appear on the pages of my sketch book. they come from a place i can't quiet explain that just "feels". and urge me to see it through to a finished illustration. (some images come easier than others). as i continue to work. it is then my conscious mind finally catches up. this piece is all about my thoughts of home. for it is home that i am loved for just being me. no matter how old you get. may you always feel home wherever you are. jamie, thank you so much! it is sometimes very difficult for me to share some of my deepest thoughts and feelings. especially, with not knowing who will read this. so, a huge thank you for not only putting a smile on my face this afternoon but also letting me know that my sharing resinated with you. it really means so much. I love it so nice!! Stacey, you inspire me everytime I see such beauty. Your art your inspiration ahhh such beauty. aileen, such beautiful words that you have given me. i can't thank you enough for the smile that is in my heart. sorry for beeing so late for commenting,grmpf. 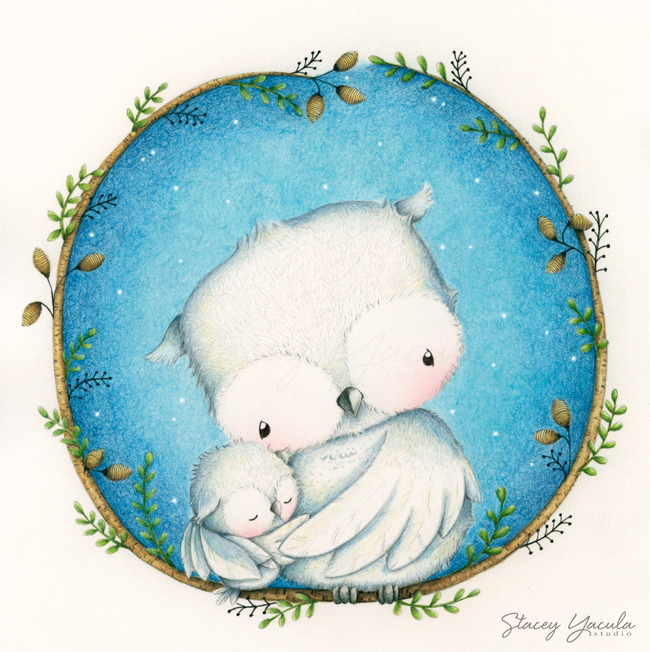 These cuddling owls,mum and child look so adorable.Looking at this lovely creation fill my heart with happyness! I can follow your thoughts that sometimes it is very diffycult,talking about feelings.But don´t worry I love this,when you speak about feelings of your soul.You´re a woman with so much sensitiveness and a heart full of love.You love to live with all highs and deeps,that life will give.In your world as an artist these feelings are living on in your characters,that´s so special. Each image tells an own story of feelings and this is amazing - I love this so much,thank you. For many years I must live in retirement.There are only a few things left,I can do without any help. Most of the time I live alone and I love my stamping hobby,very much.I love it to color your lovely and cutie images,creating scenes,making cards and other nice things.A beautiful way to make many others happy by sending greetings or a little present.I love this so much and it make me very happy.A tiny luck. When coloring your images I like to dream of an imaginary world,everything is fine and beautiful. Sometimes there is some sadness,but most of the time it flies away,smile. Pat, Thank you for writing and giving me such sweet words to carry with me. I do hope this brings others a sense of peace, especially us mothers who are the ones that carry the love for our children like no one else.